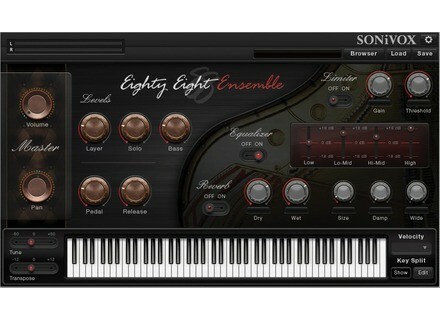 Eighty Eight Ensemble 2.0, Virtual Electric Piano from SONiVOX MI. Announced last january during NAMM, version 2.0 of the Eighty Eight Ensemble is now available for purchase. Eighty Eight Ensemble 2.0 reproduces the sound of a Steinway CD 327 grand piano, thanks to the 1500 samples, 16 dynamic levels per note and 7 velocity curves. A 4-band EQ is included, as well as a limiter and a reverb section and you can control the sustain pedal, the hammer release, the size of the room and the damping. The virtual instrument also features a MIDI Learn mode with the ability to store and recall setup presets. The library ships with 100 ready to play patches (52 solo piano presets, 35 combis and 16 Key Split combis with bass and/or additional solo instruments) and a patch browser allows for class, genre, character and name filtering. 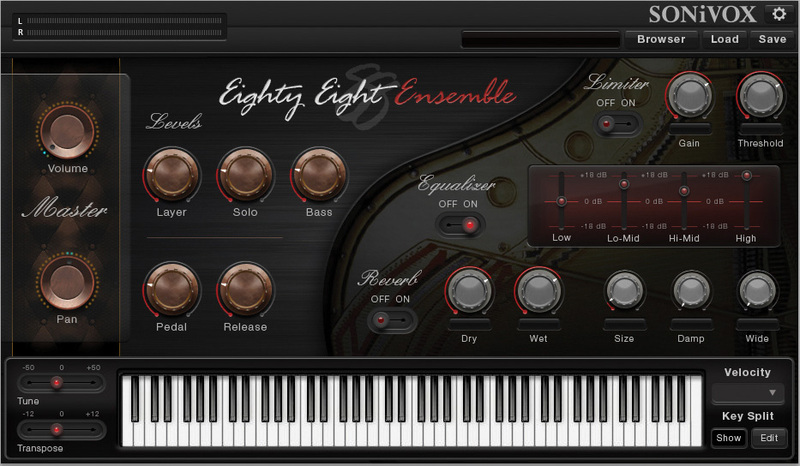 Eighty Eight Ensemble 2.0 is a VST, AU and RTAS plug-in for Mac OS X and Windows 32 and 64-bit. It is available for $149.99 and the update for previous version users is available for $29.99. More details at sonivoxmi.com. Audiobus now included in IK VocaLive IK Multimedia updated its VocaLive vocal processor app to version 1.6, which now supports Audiobus. AcousticsampleS samples the Clavinet D6 AcousticsampleS has released Clavi D9, a sample library of the Hohner Clavinet D6 for the UVI Workstation. New mix preset library for EZmix 2 Toontrack announces the release of The Mix Toolbox EZmix Pack, a new expansion pack for its EZmix 2 software.